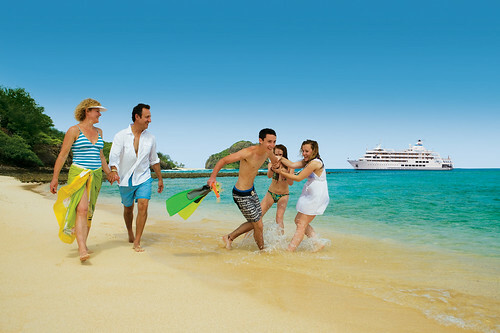 Captain Cook Cruises Fiji have extended their Kids Eat, Play and Cruise for Free deal on selected 3, 4 and 7 night cruises until 31 October, 2014 with travel between 01 November 2014 and 31 March 2015. Fiji is not only a fun place for kids and relaxing for parents but Captain Cook Cruises small ship Reef Endeavour, also offers a fantastic cultural learning environment for families. From visiting unspoilt Fijian villages and schools and getting to meet and know the local children to experiencing a Fijian church service and traditional village Sevusevu ceremony, Meke and Lovo feast, the 'real' Fiji is definitely discovered through truly heartwarming cultural experiences. As well as being immersed in Fijian culture, kids will have hours of fun snorkelling over coral reefs, playing on white sandy beaches, swimming in crystal clear waters, and learning about marine life on a glass bottom boat ride or from the resident Marine Biologist and Cultural expert. Adults can have the extra thrill of diving in this spectacular underwater world. Families can also stay on board and adults can enjoy being pampered at the ships Senikai Day Spa, or relaxing on the sun deck by the spa or pool while enjoying a cocktail, all while your children are being looked after for free. Complimentary child minding is provided for children 5-10 years between the hours of 9.00am-12noon, 2.00pm -5.00pm, 6.30pm-10.30pm and a brand new kids program is being implemented for 5-10 year olds with some great fun Fijian inspired activities. Child minding supervision is available in the swimming pool or spa, in the Reef Room where children can watch movies and play board games, onshore for beach activities and in passenger cabins. Nanny hire is compulsory for children under 5 years and included in the infant price for 10 hours day. Captain Cook Cruises offers a range of family accommodation from family cabins that sleep four to inter-connecting family staterooms. This amazing deal is valid for every child aged 5 – 17yrs travelling with an adult on selected 3, 4 and 7 night Yasawa Island Cruises and 7 night discovery cruises including Four Cultures Discovery Cruise and the Colonial Fiji Discovery Cruise. Early Booking Savers (EBS) fares start from AUD$981.60 per person twin share for the three-night cruise, from AUD$1316.80 per person twin share for the four-night cruise, and from AUD$2067.20 per person twin share for the seven-night cruise. Kids eat, play and cruise for free when accompanied by a paying adult. Prices include all meals on board, guided village and island tours, glass bottom boat excursions, on board Wifi, entertainment, child minding for children 5-10 years and use of the ship's facilities including swimming pool, spa, pool bar, sun deck, sauna, cocktail bar, day spa and library.